Nabors Garage Doors is your Top Rated Local® Garage Service company in Woodstock, Georgia and the surrounding area. Our garage door experts are professional and reputable, providing each client with the highest quality garage door repairs, replacement, and installation in the industry. We’re also proud providers of Liftmaster Elite Series® and Premium Series® garage door openers. Nabors is a locally owned company that has served the Georgia community for years. We’re happy to provide each client with specialized care, whatever their needs may be—we’re here to help. Consider us your local garage door experts. Whether you’ve already picked out your new garage door and just need an expert to install it for you, or you want an experienced professional to recommend a garage door for you, Nabors Garage Doors is always here to help. Garage doors are a big investment and they can go a long way to making your home look aesthetically pleasing as well as be functional and efficient. We understand that, and we want you to get the best value for your Woodstock home. When it comes time to install a garage door on your Woodstock home, you’re going to want to have plenty of options available to you, and Nabors has just that. Maybe you’ll choose to go with one of our traditional style Amarr steel garage doors, a simple and great look for any home. You’ll have the choice of four different panel designs, countless window offerings, and six base colors. Or, maybe you’ll choose one of our carriage house doors in either steel or wood. These doors give the impression of an authentic carriage house door, but with the same functionality of a standard garage door. Finally, we have our specialty garage doors. These garage doors are made of aluminum and steel and are great for modern-looking homes. We are happy to provide Woodstock residents with dependable and affordable garage door repair services. If you’re having an emergency with either your garage door itself, the motor, garage door opener or any other part of your garage door, don’t hesitate to contact Nabors Garage Doors, we’ll rush to your location and get it fixed. The problem with having a broken garage door is that you may have a vehicle either stuck inside that you can’t get out, or a vehicle stuck outside that won’t be protected from the elements. Also, if your garage door is stuck open or partially open, it could pose a security risk to your home. We have 24-hour same-day emergency service, so you’ll never have to wait weeks for a specialist to visit you and fix your garage door. If you need garage door services in Woodstock, you have no time to lose. 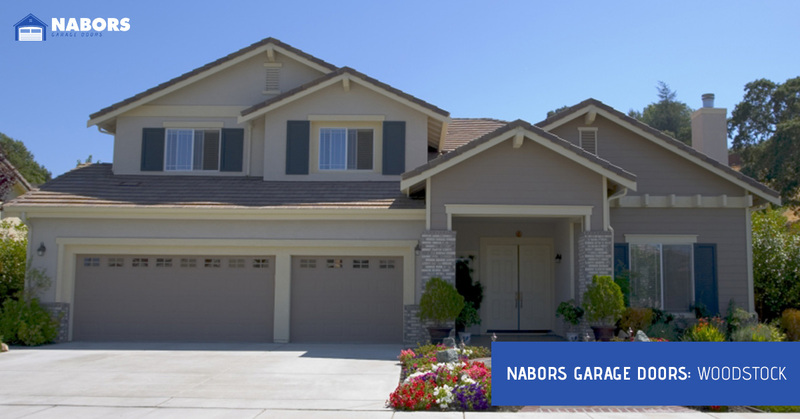 Call a garage door specialist at Nabors Garage Doors and see why we’re one of Georgia’s most affordable, friendliest, and trusted garage door service companies.